Back in November last year I made a post, in which I mentioned something of my current direction in spinning, I am calling it ‘yarn architecture’. I know, its yarn.. a bunch of fibers twisted together. But .. what twists we can create! Yarn architecture: building – constructing – layering – intersecting lines and angles. I love the complexity and the simplicity. I also love the challenge. I had already begun this particular direction earlier in the year, looking for ways of plying and creating, and tending towards over-thinking things anyway, it seemed a natural way for me to go. 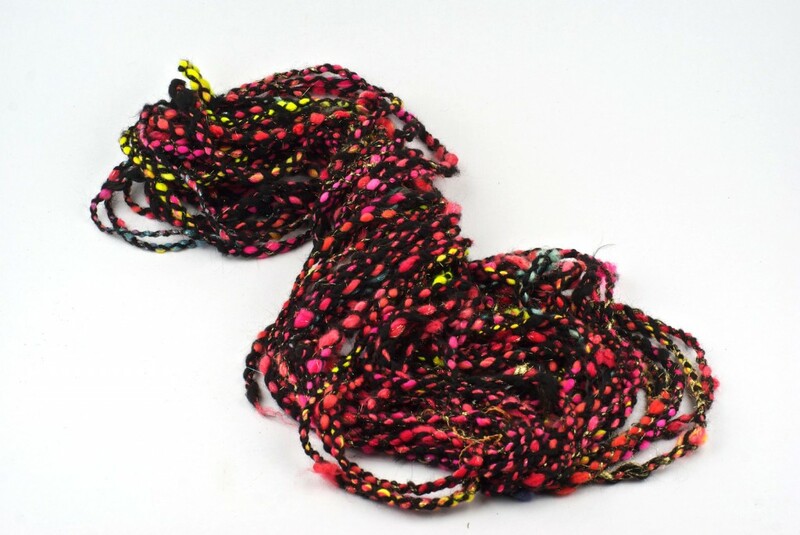 I particularly liked the idea of taking traditional spinning methods and using them with non-traditional preparations, like, a cabled yarn, made with uncarded locks, or like this one, with bits of sari silk splashed around here and there. That is another yarn that can be made large and crazy wild, or fine and intricate. Its really fun to move between those things even within a single construction, to really explore it. There are also possibilties for taking really standard constructions such as a boucle, and to play with the elements within that, for example, I made this super bulky boucle with a fine (traditional) single spun from Wensleydale (for the curls), and plied with a very bulky merino, instead of the standard fine single that would normally be used in a boucle. This has all the elements of a ‘standard’ boucle, but I altered them a little to really change the end result. I also really liked how the sheen of the wensleydale worked against the soft bulky merino it was plied with. This is what I find most interesting about being a Yarn Architect, taking a standard construction and adding to it, or altering the components, or combining them in a different way to ‘build’ something a bit different. Architects have always done this, taken a standard construction, four walls, a floor and a roof, and altered them into new shapes, designs, patterns, and colours. I think its really awesome that I can share these techniques with people who don’t have an Aura or a Country Spinner but are looking for challenges in their spinning. When Esther Rogers issued me with a challenge to spin a building, it was the perfect time to try out some colour experiments with the cabling I had been messing around with, I had been trying out things like autowrapping before plying the cables, for example, and this worked really well for what actually was architect related spinning! The inspiration for the challenge was a photo (from Stephen West) taken of a building in Copenhagen. But this does also mean that I am now building up a little library of multiple plied yarns, and maybe you noticed a theme here, the ebooks we just published on Fiberygoodness.com are also record keeping log books for spinners, apparently record keeping IS my current focus at the moment 🙂 I will be making worksheets out of these experiments to give people at workshops this year, and if you keep an eye out for upcoming WoolWench newsletters you are likely to see some of the outcomes of the experimenting and mini tutorials on the most successful of them. This is soooo inspiring! I love the idea of being a yarn architect (I thought of yarnchitect), not just spinning or plying but we are actually building up layers and constructing a three dimenstional creation. Truly lovely, and that building! I am looking at the buildings around me with new eyes. I love your choice of “structures” (yarn structures and building structures) Thanks so much for sharing your process, I wouldn’t have thought to combine all of those different elements. What a great challenge, to spin a building! It’s also a great learning challenge to take all the different kinds of fibers you can find and spin each one, find out what they suit best, how to spin them, also a great record keeping opportunity 😉 Happy spinning Beth! 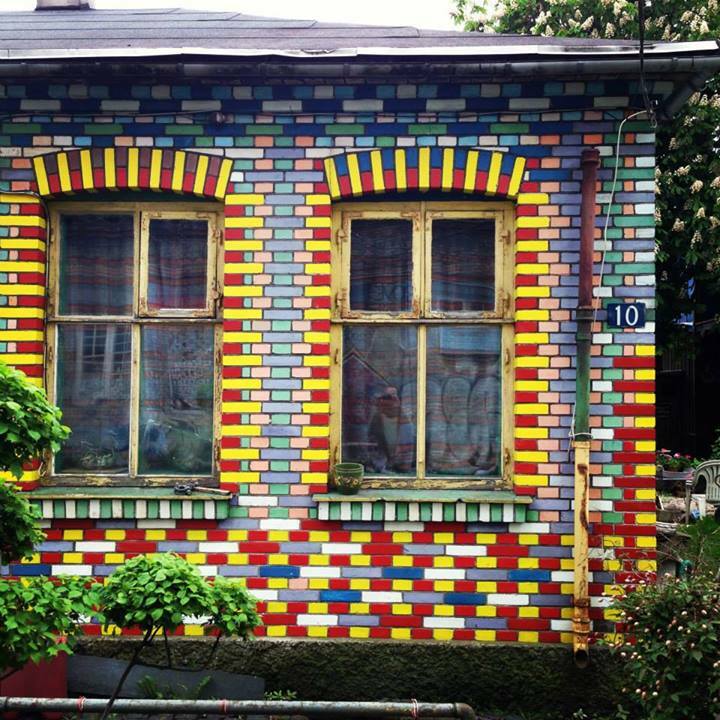 lol the photo of the Danish building and your resulting yarns make me think of Legos (also Danish)! 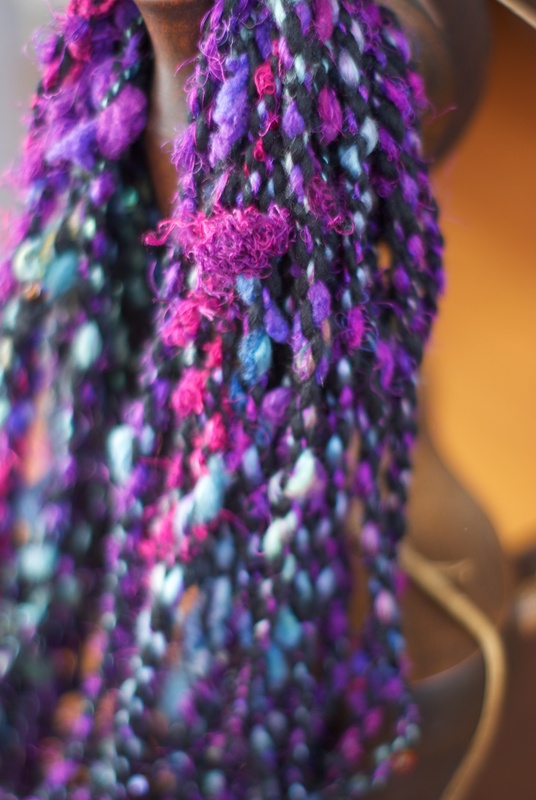 Thank you for sharing some of your mental processes in yarn creativity! I think of doing things like this and then I fall into a ‘default’ spin setting as I’m usually working with a hand-dyed fiber and am happy/satisfied just watching the color spin out. 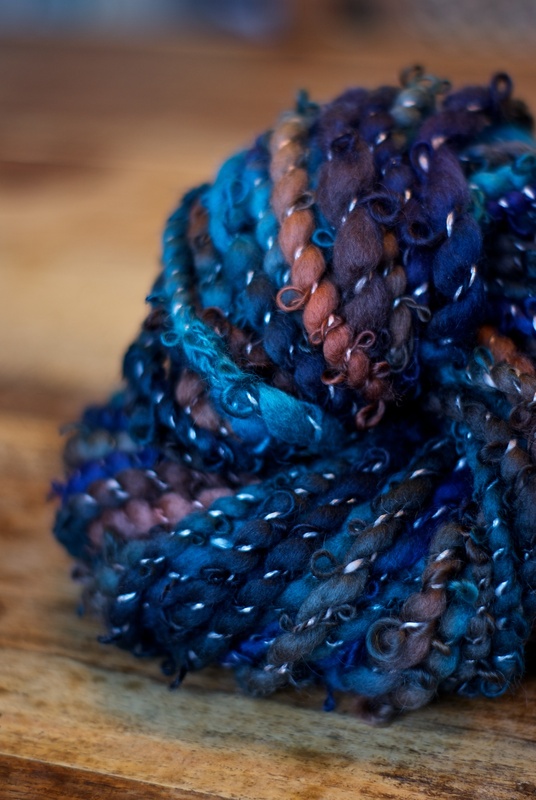 Those colours in our hand dyed fibers are a treat on their own aren’t they!